A great time was had by everyone who attended the meeting in September at Stacey’s. Stacey and Ann always treat us right with good drink specials and a complimentary Buffet. Jon did a great job entertaining us! Jamie and Beth racked up with the 50/50 drawing! And we gave away some great raffle prizes. 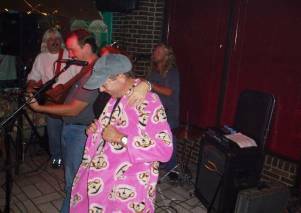 Charlie… modeling the Monkey Robe at Billy’s Benefit at Tropical Escape. 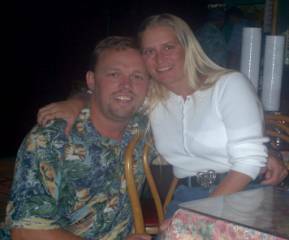 We raised 1000.00 on a Monday night at Tropical for the James family. Thanks to everyone who came out and supported it! Jon Durham and The Forlorn Hope and The Brangle Brothers were very generous with their time. Some drove over an hour to donate their time to the event! a splash of hot sauce. Shake well & garnish with a lime. Delicious! Registration for Parrotstock 2k5 now open! The dates are June 9-12 and the venue is The Ocean Dunes resort in Myrtle Beach. The musical line up is starting to come together with The Caribbean Cowboys, Erik Smith and Joe Bennett confirmed. Negotiations are underway to have The Peter Mayer Group and Tina Gullickson as well. We will keep you updated as we know. To register for Parrotstock 2k5 please visit the Parrotstock website at www.Parrotstock.com. Jon Durham…October 7th, Patriot in Chester…October 16th, Kingstree SC, Fall Festival…October 21st, Corner Pocket, Columbia SC. Next meetings…October 12th…Stacey’s, Rock hill….November 9th in Chester. Sandlapper PHC Christmas party…December 4th at Beacon Knoll Club house in Fort Mill. Peter Mayer …Christmas Concert…December 16th, Concord NC. Adopt A Highway last year….. 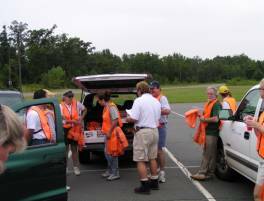 Thanks again to everyone who helped with the highway cleanup in September! Our next cleanup is December 4th. Last call for calendar pictures ladies. Please get them to Mary or Mark ASAP.